The Four Seasons Resort and Club is your home for golf instruction. The photos on thie page as well as those in our photo gallery provide a brief introduction to the outstanding facilities that house the Four Seasons Golf School. Students from around the wolrd come to the Four Seasons to take lessons and get club fittings as well as participate in clinics and corporate outings. Practice where the pros practice. The Four Seasons Resort and Club was the host to the AT&T Byron Nelson Championship through 2017. Following the 2008 renovation by D. A. Weibring, the short game area has received rave reviews from tour players and amateurs alike. It boasts a one hundred yard, two-tier serpentine-shaped green that allows players to practice virtually any short game shot. 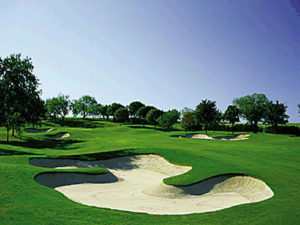 The green also has two bunkers similar to the style of bunkering featured on the TPC Golf Course. The driving range has an expansive grass tee and nine hitting targets to help you hone your swing. A covered hitting bay includes six heated slots with mirrors for practice during inclement weather. The 1,500 square foot Golf School building houses the instructional team. Complete with wet bar, dining and lounge area, flat screen TV, fireplace, and outdoor patio, the building also serves as an entertainment venue for corporate golf schools and hotel functions. The resort is also home to the Hall of Champions which is a museum quality exhibit featuring the life of golf legend Byron Nelson. The hall also has a picturesque display of champions of the AT&T Byron Nelson Championship since 1983. 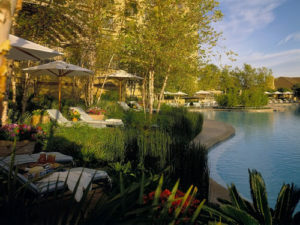 For more information visit the Four Seasons Resort and Club Dallas.